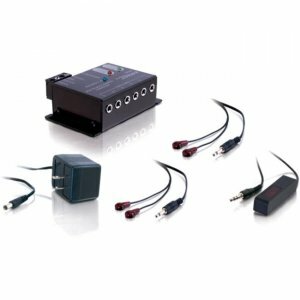 Remote Control Repeater Kit contains all equipment necessary to remotely operate 4 components (expandable to 12 components) using your standard remotes. Mount the IR receiver in a central location and connect to the IR Distribution Block. This block repeats the signals through emitters to your electronic components. Your components may now be mounted in your entertainment center, closet or another room! The kit is self-contained and easy to connect.